Today is Shoshthi or the first day of the Durga Pujos. It is also the 9th birthday of Finely Chopped. I had written my first post here on 7th October 2007. Kingfisher Airlines has shut down. I am still plagued by bad airline food though. 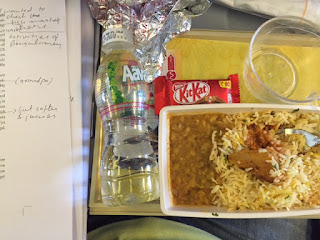 I recently ate a strange dish of soggy rice with fragmented bits of sponge inside and channa dal on the side on a flight. 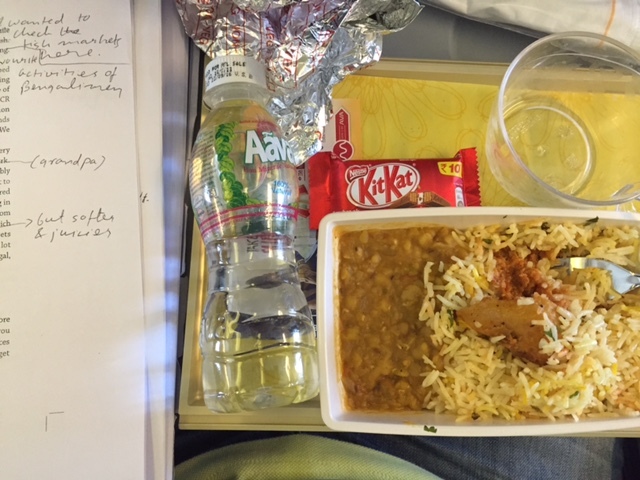 The air hostess called it a 'chicken biryani' for some reason. An interaction I then had with the airline’s customer service on mail made me realise that they don’t really care about feedback, or about improving things. So, there is no point my writing about them here to be honest. I fly that airlines for the miles and that’s all now. Of course I rarely do posts which are three paragraphs long these days. In fact sometimes my posts can hit 3000 words! If I do 3 paragraph posts now, its on Instagram or Facebook and shorter ones on Twitter. I doubt if I had Instagram and Twitter accounts when I started blogging. I put pictures too now. Not very well photo-shopped or styled ones. Pictures I take on the go. Often on my iPhone. I have had my own laptop for a while and stopped depending on office laptops a while back. My wife, Kainaz of ‘K’ fame, gave them to me. I occasionally use my phone or iPad to blog. Very rarely though. My mom, ‘The Tabulous Mom’, is the one who blogs using her tab. When I started blogging in 2007, I used a slowly dial up internet connection, that I had got from office, at home, and the office internet connection at work. Also, the thing is, I don’t have an office now! Though I like to call Candies that. Candies is a café in Bandra from where I work every morning. Except on Mondays when I go to Smoke House Deli as Candies is shut on Mondays. So what did my day look like today? Well, I did my morning chanting. I am a member of the Soka Gakkai International, a lay Buddhist organisation devoted to peace you see. Then I went to Candies and got the proofed typeset manuscript of my book in place to courier to Hatchette, my publishers in Gurgaon. Yes, I am writing a book. Began writing it in mid 2014. It’s going to be be called The Travelling Belly. It was named by K. Just as she was the one had earlier named Finely Chopped too. Actually she was the one who had suggested I start the blog 9 years back. The book is going to an anecdotal food travelogue covering some of the cities of India. There are no recipes or lists in the book. Just tales of my eating around the country. Writing a book is a very different experience from the instant gratification and independence which blogging offers, and two and a half years after I began writing it, we are about to go to print. Like a slow cooked pujor bhoger khichuri, the book too, I like to believe, will hopefully benefit from the time it took to come into existence. I managed some pujo shopping after that before lunch. Then I came and uploaded a post that I did for a client. Then sorted out formatting bugs in the post after a quick and late lunch at home. I napped. Woke up and sent a client proposal. I missed my yoga today but otherwise going to The Yoga Institute at Santa Cruz in the evenings is something I look forward to on weekdays. Some fellow SGI members came over home in the evening to chant. We skipped the Durga Pujo this evening and will probably go with mom tomorrow. Yes, a very different day from what it would have been on 7 October 2009. That day I would have got up and got ready for work. Driven down to work. Or been driven (not sure if we had a driver then) down to my office at Dadar. Now I use an Ola or an Uber and rarely use the car. I would have spent the day in meetings, looking at research reports, surfing the internet, headed home in the evening and then, after dinner tried out this new thing that K had suggested I start. “It’s called a blog,” she had said. My transition to a freelance writer, from being a full time market researcher, was not a planned one.but the blog played a starring role in setting it up. It’s thanks to the blog that I got assignments from agencies and brands. Then writing assignments too. Some ad hoc. Some contracts. The work has been diverse and very enjoyable. The book is thanks to the blog. It was a fellow food blogger friend, Rushina, who had connected me to the publishers who probably saw potential in the blog and commissioned the book. The work I have on my plate today is why you won’t see me blogging as regularly now. Plus a lot of my day to day life is chronicled in other social media avenues such as Instagram, Facebook and Twitter. I don’t know what the future holds. I have realised through Buddhism, and through experience, that it is best to live in the present than to dwell about the past or fret about the future. Though, while I wrote this post I did wonder, just a wee bit, how my day will look 9 years later. Dekhenge as they say in Hindi. What I do know, is that I will continue to blog as long as I enjoy it. The posts in the future might read different from what I write today. Just as today’s post read very different from the first one 9 years back. Anyway, if you have hung around so long, then a big thank you to you. And even if you have not. It is you, the readers of Finely Chopped, who have kept this story going. And thanks to my friend, and one time colleague, Kashi, for making me conscious of celebrating the birthday of Finely Chopped by reminding me of the date every year. 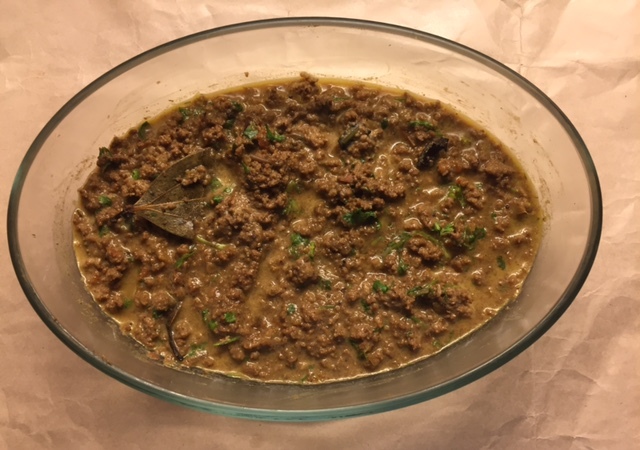 The keema our cook Banu is making based on a recipe from Osama Jalali that I gave her. Adding a food connect to the post! Hope to continue see you around here. Happy birthday Finely Chopped! Thanks for giving us such happy reads of small and big discoveries with straight from the heart commentary. Keep posting for now you are blue ticked and you owe it to your readers. Well done Kalyan! Hv been following your blog and instagram for a long time.. love all your stories and ofcourse your love for all kinds of food.. you hv brought tons of pleasure to many strangers like myself! Through you stories I hv connected with the many restos and eating trips of yours..
thanks a ton and best of luck with your book.. hope i get my hands on it somehow.. keep the belly travelling and the fire burning!! Thank you for inspiring so many like me to put our love for food out there on the internet. Happy Birthday Finely Chopped. Reading the blog always fills me with warmth and happiness. What a journey it has been !!!!! Keep the core of this beautiful blog intact and pure. Cheers mate !! !